The Norwegian University of Life Sciences (NMBU) is located at Aas (Norwegian spelling: Ås), some 40 km. south of Oslo. The distance from Oslo Airport to the NMBU campus is 80 km. On this page we’ll give you a few guidelines on how to get there. 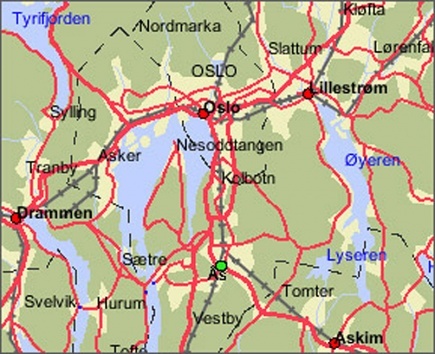 On the map above, Ås is marked with a green dot. From both Oslo and the Oslo International Airport (Gardermoen) you can travel to the university by bus, train or car. By train >> Intercity and express trains depart every half hour from Oslo airport to Oslo Central Station. The Airport Express Train (Flytoget) has frequent departures to Oslo, but is an expensive alternative. From Oslo Central Station take the local train heading towards Moss, departing once an hour during the daytime. Exit the train in Ås (the train from Oslo S stops at Holmlia and Ski before arriving in Ås), then walk, take bus no #510 or take a taxi from the station to NMBU (1 km). By bus >> The airport bus service is run by NOR-WAY Bussekspress and departs from the airport roughly once an hour. The best option is to catch the bus going towards Fredrikstad, route F11. Ask the bus driver to stop at Korsegården, located approximately 1 km from the university, and continue by bus #510 or taxi. The Korsegården stop is located next to a Shell petrol station. Upon request, the bus driver can have a taxi waiting for you at the petrol station. Alternatively, you may catch the airport bus to Ski (route F4) and continue by taxi or local bus from Ski. As Ski is located some 10 km from NMBU, a taxi is an expensive alternative. Local bus #510 departs from Ski every 15 minutes (daytime) and every half hour (evenings) and will take you directly to NMBU. At NMBU the bus stop is called "Universitetet i Ås". By car >> NMBU is located close to the E6 motorway. From Oslo follow the signs going towards "E6 Gøteborg". About 40 km from Oslo turn off the motorway at the sign "Ås, Universitetet". Turn left at the roundabout, cross the motorway and continue past the Shell petrol station situated on your left, along Drøbakveien. The NMBU campus is on your left-hand side a bit further down the road (see the map Google Maps).